On weekends, I throw away all caution and eat whatever I want. By whatever, I mean that I will put that extra pat of butter in my food, have that extra scoop of ice cream just because, and possibly have a bottle of wine all to myself. I had my old flatmate and friend over for dinner over the weekend and 13 years ago, she was the official cook of our condo, while I could barely boil a pot of water properly. We don't see each other much and she wanted to try my cooking so I willingly obliged. I decided to go for something simple but delicious- Roast Chicken! 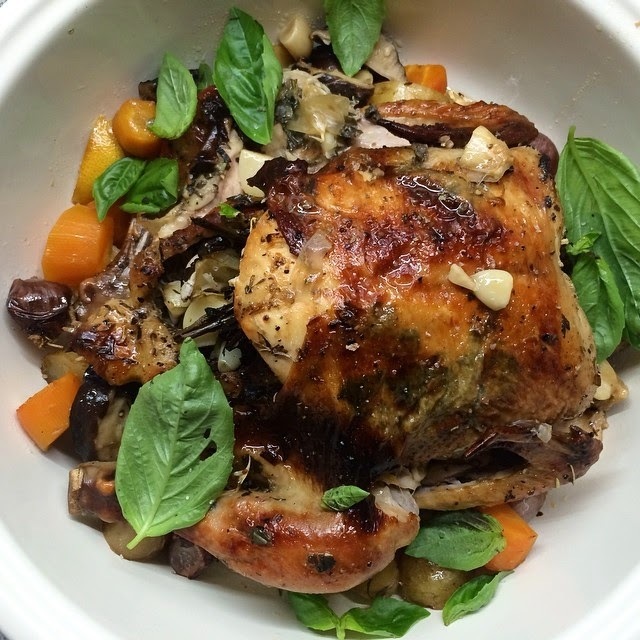 There are so many ways you can prepare a roast chicken, so many spices and herbs that you can add to flavor the bird, but my one big secret to make sure it's always SUPER good is that I ALWAYS use fresh herbs. Oh, two secrets, I also always find a way to incorporate butter into the equation. For this roast, I chopped some tarragon, sage, basil and garlic and mixed it in with half a stick of butter (1/4 of the bar- salted please) I then stuffed the butter under the chicken's skin, by the breast, the legs and even under and put the rest of it into the cavity, along with a head of garlic cut in half, some shallots, and more of the herbs I added to the butter and half a lemon. I poured some olive oil on the chicken, added salt and pepper and left it to marinate for about 6 hours. I preheated my oven on a low heat setting and cooked this baby for and hour and a half, before I cranked it up and removed the foil to cook it for another hour. Oh remember to add some chicken broth and/or white wine to the dish you are cooking it in, as well as some roughly chopped carrots, potatoes and shallots.